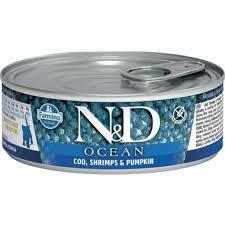 N&D Ocean Cat Cod, Shrimp & Pumpkin Recipe for Kitten is formulated to meet the nutritional levels established by the AAFCO Cat Food Nutrient Profiles for growth and gestation/lactation. 100% Satisfaction Guaranteed. Ingredients: Cod, herring, salmon, sweet potatoes, shrimp, pumpkin, herring oil, fructooligosaccharide, calcium carbonate, potassium chloride, vitamin A supplement, vitamin D3 supplement, vitamin E supplement, menadione sodium bisulfite complex, choline chloride, zinc methionine hydroxy analogue chelate, manganese methionine hydroxy analogue chelate, ferrous glycine complex, copper methionine hydroxy analogue chelate, DL-methionine, taurine.